Originally introduced in 1954 with the reference 6542, the GMT-Master was developed specifically for Pan-Am Airlines, after the company requested a reliable watch that was capable of simultaneously displaying multiple time zones – for use on transatlantic flights. By adding a 24-hour hand and a rotating bezel with 24-hour markings, pilots could quickly reference another time zone by simply turning the bezel and using the 24-hour hand as an indicator. A vintage GMT-Master 1675 has a high value in the secondary market. A clear reference to Greenwich Mean Time (the prime basis of standard time used throughout the world), the GMT-Master name was intended to serve as an ever-present reminder that the watch was designed for long-distance travel. Although simple in execution, the GMT-Master was an instant success, and soon pilots and frequent travelers alike were purchasing the watch for its dual time zone capabilities. 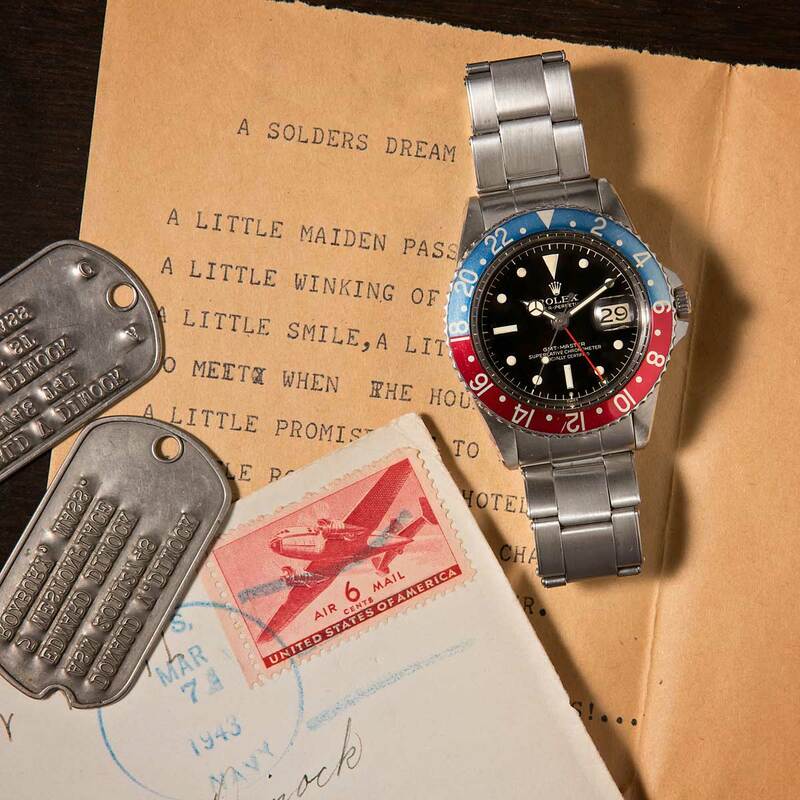 In 1959, Rolex released an update to their GMT-Master line with the reference 1675. In addition to a new movement and a slightly re-designed dial, the most notable difference was the addition of crown guards to the case of the watch. 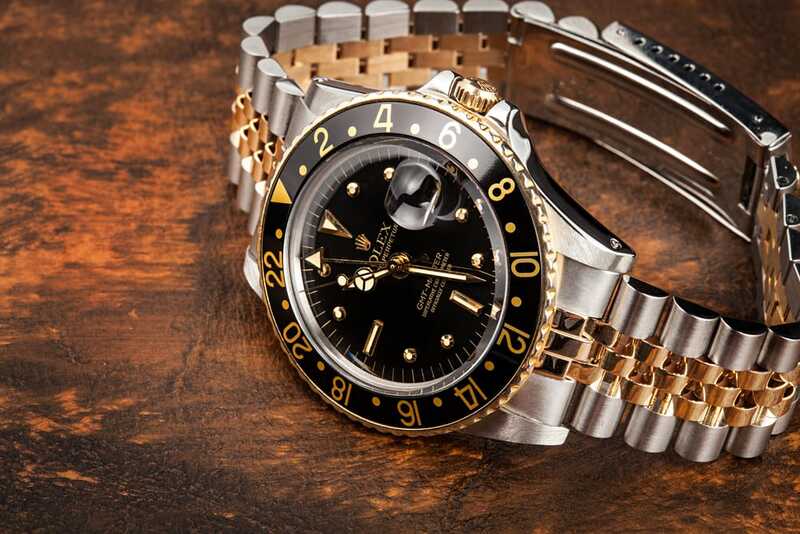 Initially, the reference 1675 had a case with pointed crown guards; however around the mid-1960s, Rolex changed the design to the more traditional crown guard shape that can be found on later renditions of the GMT-Master and GMT-Master II lines of watches. Originally made for Pan-Am pilots, the GMT-Master now serves as an iconic timepiece. Early examples of the reference 1675 were fitted with gloss dials, small 24-hour hands, and Rolex’s Caliber 1565 movement, while later examples received matte dials, large 24-hour hands, and the Caliber 1575 movement (which added a hacking seconds feature). Additionally, while the GMT-Master was originally fitted with a red and blue bezel insert – to match the company colors of Pan-Am Airlines – Rolex introduced the option of an entirely black bezel insert during the early 1970s. These various changes were not all implemented uniformly; and since Rolex manufactured the reference 1675 GMT-Master for over two decades until production ceased in 1980, surviving examples of the reference 1675 can be found with a wide variety of different dial, case, bezel, handset, and bracelet variations. These numerous yet subtle differences, along with the overall condition of the watch, can be responsible for significant differences in resale value for seemingly very similar watches. There are many variations of the GMT-Master 1675. While Rolex’s latest iteration of the GMT-Master has received a large, Triplock winding crown to match many of their other sport watch lines, the reference 1675 GMT-Master was fitted with a smaller, Twinlock crown that was similar in size to those found on the Datejust and Day-Date watches. The superior water resistance of the Triplock crown was initially not deemed necessary for a pilot’s watch, and as a result, the reference 1675 GMT-Master was originally only water resistant to a depth of 50 meters – compared to the 100-meter depth rating of later references of the GMT-Master and GMT-Master II lines of watches. On the wrist, the painted hour markers, acrylic crystal, and aluminum bezel insert give the reference 1675 GMT-Master a true vintage look and feel. 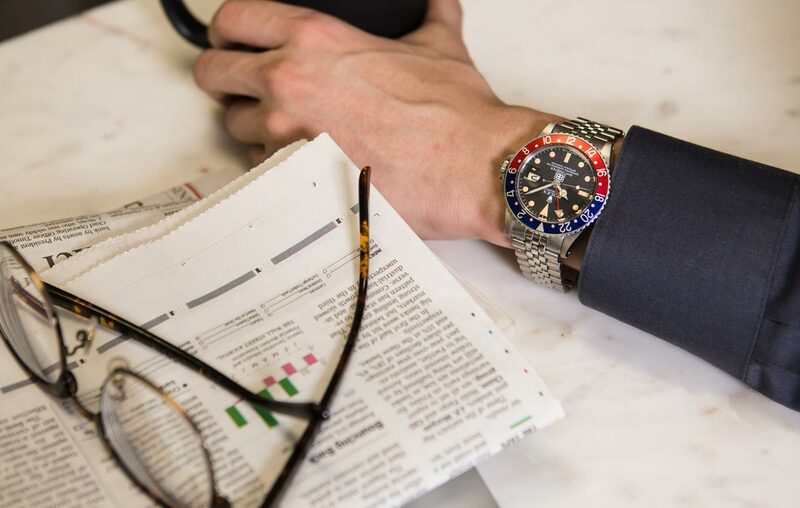 Although the contemporary version of Rolex’s GMT-Master II closely resembles the current version of the Submariner, the reference 1675’s small crown, thinner case, and red 24-hour hand help instantly identify the watch as a GMT-Master, rather than a Submariner or Sea-Dweller reference from a similar year of production. 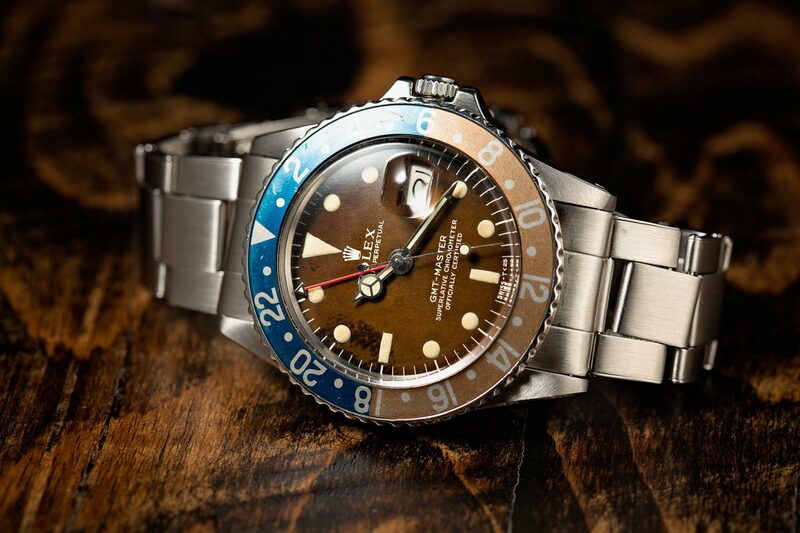 A Vintage Rolex GMT-Master ref. 1675 such as this typically calls for a high price. 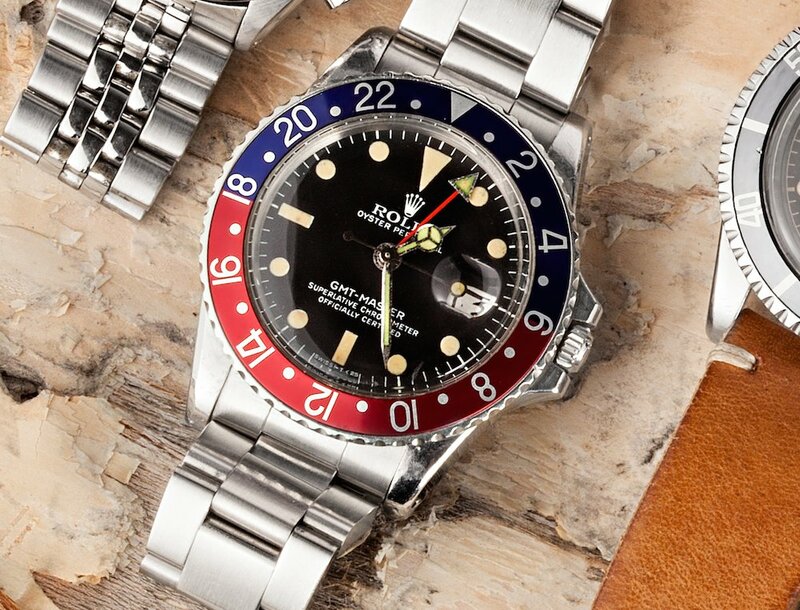 Given that the reference 1675 GMT-Master is a vintage watch, brand-new examples have been unavailable through authorized dealers for several decades. While the pre-owned market is currently the only place to find a reference 1675, examples can still be found in pristine and unworn condition, with all of their original boxes and packaging materials. Due to its remarkably long production run and the numerous variations in dials, hands, movements, bracelets, and bezel inserts that were fitted to the reference 1675 GMT-Master, prices can range dramatically depending on the individual watch and its overall condition. As with all vintage watches, age and history should always be taken into consideration when attempting to verify the authenticity of a reference 1675 GMT-Master. Even an unworn example should look somewhat old since the watch left the factory (at minimum) over a third of a century ago. While vintage watches will inherently have more discrepancies among them, all of the usual rules for verifying authenticity still apply. Before any purchase is made, one should always examine the dial, the reference and serial number engravings, the bracelet (and its accompanying markings), the bezel insert, and (if possible) the movement. In some cases, there are icons on the dial of a GMT-Master 1675. Authenticity will always be most important when purchasing a luxury watch; however, condition and originality will be the chief areas of concern when considering the purchase of a reference 1675 GMT-Master, as they have the ability to significantly impact resale value. Due to its long production run and the vast number of minor variations that exist between surviving examples, prices for reference 1675 GMT-Master watches can range dramatically, so it is certainly a watch worth thoroughly researching before a purchase (or sale) is made. Although it was not the very first GMT-Master watch that Rolex ever produced, the reference 1675 is possibly the most iconic and recognizable GMT reference that has ever been manufactured. In addition to marking the introduction of crown guards to the GMT-Master (a trait that has remained present ever since), the reference 1675 also represents the beginning of bezel color options for the GMT-Master line of watches. With an incredibly long production period that spans much of what we now consider to be the era of vintage Rolex, the reference 1675 stands out as a quintessential example of Rolex’s legendary, multi-time zone pilot’s watch. The GMT-Master reference 1675 is an incredible watch with an intriguing history and journey.